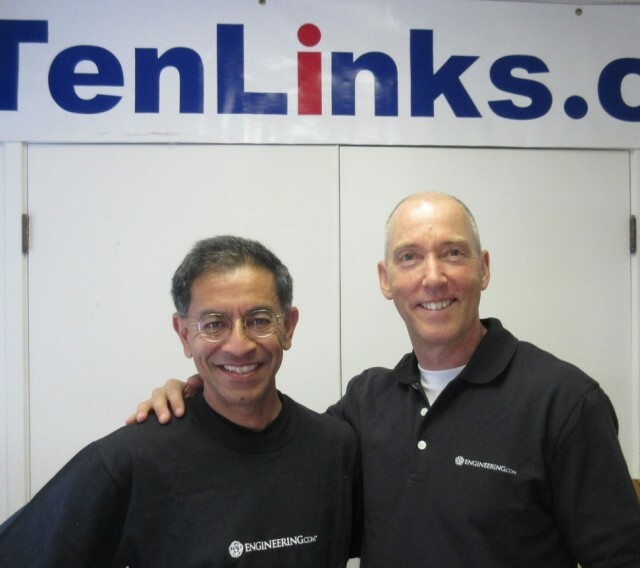 TORONTO, Ontario and NOVATO, California, April 23, 2015 -- TenLinks and ENGINEERING.com, leaders in engineering and design media, announced today that they will merge their operations. Roopinder Tara, founder of TenLinks, and John Hayes, CEO of ENGINEERING.com at TenLinks headquarters. The industry leading expertise and reputation of TenLinks contributes greatly to our mission to inform, inspire and entertain the worldwide engineering community," said John Hayes, CEO of ENGINEERING.com. "Design is a critical part of engineering, and TenLinks solidifies our coverage and presence in that segment." For Roopinder, the merger with ENGINEERING.COM furthers his commitment to give back to the profession for which he was trained. A registered professional engineer with 10 years of industry experience in design and analysis, a master's degree in engineering and 18 years of publishing experience, Roopinder is ready to provide more information to an engineering audience. “Engineers coming to ENGINEERING.com will have even more articles they will enjoy reading," says Roopinder. ENGINEERING.com brings the most influential voices in engineering to a worldwide audience of engineers. Our stories are informative, inspiring and entertaining. Engineering and technical professionals use our forums at Eng-Tips.com and Tek-Tips.com to collaborate and solve problems. TenLinks, Inc. is an online CAD, CAM and CAE media company. It operates the TenLinks Network comprised of the 60 largest and most informative independent sites. TenLinks’ experts cover engineering and architecture tools and technology.